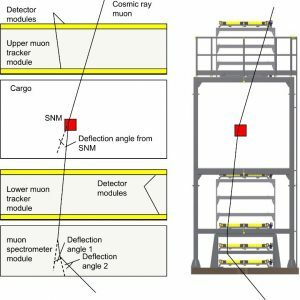 Muon tomography detects the presence or absence of heavy nuclei consistent with nuclear weapon material. It is an imaging technology that tracks cosmic muons, an elementary particle similar to an electron but with a greater mass, as they pass through and scatter on larger items. The result is a two-dimentional radiograph image. If the image has a high resolution it may be determined that an information barrier is required to protect proliferation sensitive information. Read the following technology data sheet for more information on muon tomography. The IPNDV has held sessions in Argentina, Germany, Japan, Norway, Switzerland, the UAE, and the United States.